Guide Gear® Climbing Stick and Tree Stand Combo. The whole hunting package, and a NRA "Gear of the Year" winner! SAVE BIG! 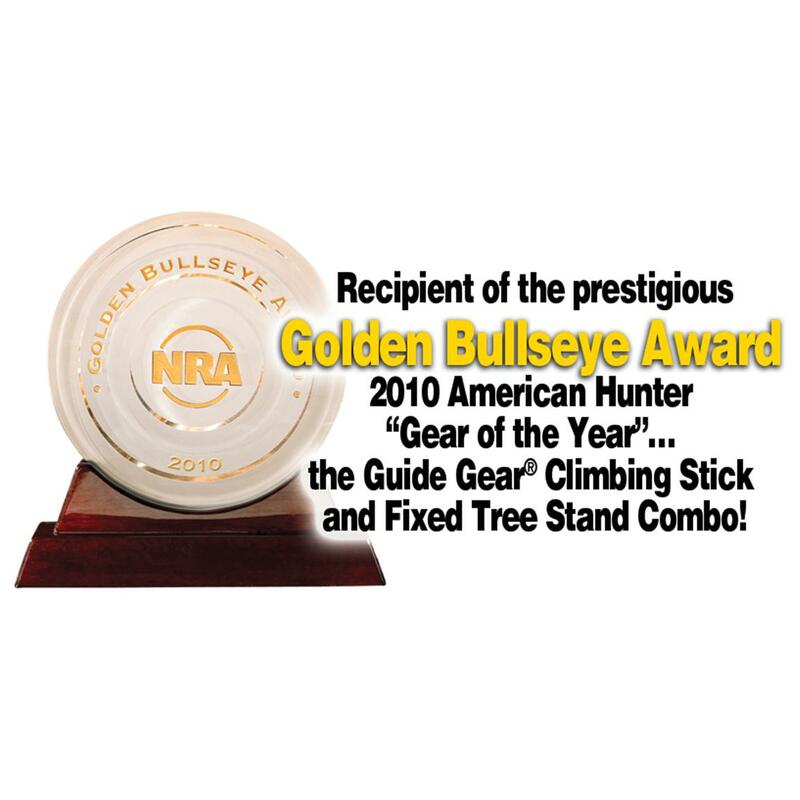 A sturdy, easy Tree Stand and a 20' Climbing Stick to get you up there... and the winner of a NRA Publications 2010 Golden Bullseye Award! This is a dynamic deer hunting duo, a direct-to-you quality bargain, and now an honoree! NRA Publications says the Golden Bullseye Award "is a symbol of excellence and innovation in firearms, accessories and related equipment." We can't disagree, and we are proud to offer the American Hunter magazine 2010 Gear of the Year winner. 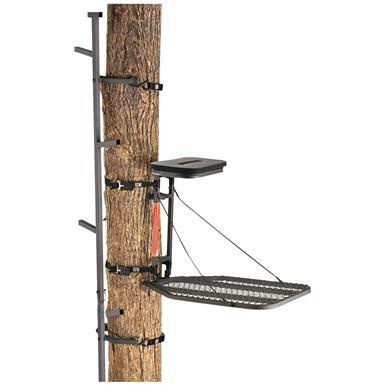 14" x 8", flip-up seat is 20 1/2"h.
Treestand includes FAS safety harness. Weighs 23 lbs., 2 ozs. Get this potent prize-winning pair now! Guide Gear Climbing Stick and Tree Stand Combo is rated 4.6 out of 5 by 223. Rated 5 out of 5 by googlefish from Great Value The product for the price is excellent. We will be buying several more. Rated 5 out of 5 by cookie from great price! easy setup and takedown,however trying to feed the ratchet straps together while hanging 20 feet up could be improved on with hooks on the ends of the straps. Rated 5 out of 5 by Chad from Awesome stand For the money this is an awesome set! I had the stand stolen out of the tree last year but for this price it wasn't that big of a deal. Will buy more and also some locks! Rated 5 out of 5 by Slick line steve from Great deal ! Great product! Easy to put up, sturdy and weather resistant. I have had mine for about 3 yrs. will be buying another one soon !! Rated 5 out of 5 by Stonecold from Great Price and Great Combo! Short and simple. I'm 250 and I stayed in it for hours no problem. Can't beat the price. When I can, I'm going to buy a few more for next season. Rated 4 out of 5 by Steve from Great value... Good setup at a reasonable price, this is a small stand, not very comfortable for "larger" hunters, but light and easy to setup quickly. Good combo for scouting different locations until you find a location where you want something more comfortable. Rated 5 out of 5 by MJBFishing from Excellent Value! I am pleased with the quality of this package, I ordered several before the season started, and just ordered several more. Came packaged with the majority of the assembly already completed.